It's pretty clear why Marshall, who died Monday at age 75, found success as a movie director following eight seasons on the classic sitcom Laverne & Shirley. "In directing movies, Marshall brought along what she learned from 178 episodes of sitcom predictability, which can, from another angle, be seen as a form of reliability," says Hank Stuever, in his tribute to Marshall. "The characters are easily understood, relatable and vulnerable. A funny person hides a little pain. A tough person is really a softy." He adds that Marshall's Laverne DeFazio was a natural heir to Lucille Ball's groundbreaking I Love Lucy character. "Outwardly Laverne was a proud broad: pencil skirts, tight sweaters (always monogrammed over the left breast with her trademark, a stylishly cursive 'L') and color-coordinated kerchiefs," says Stuever. "A competitive force to be reckoned with in the bowling alley, Laverne could put a dime in a jukebox and tear up the dance floor. Yet it was the character’s insecurities and tenderness that endeared Laverne (and Marshall) to viewers. For all her bravado, Laverne was easily deflated by embarrassment or loss. 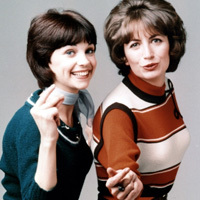 On a condensed timeline of TV history, Marshall and her co-star, Cindy Williams (as Shirley Feeney), essentially picked up where I Love Lucy’s Lucille Ball and Vivian Vance left all those chocolates strewn at the end of the conveyor belt. Marshall excelled at Ball’s type of physical comedy, ensuring Laverne would endure eight seasons of ludicrous bouts of overconfidence leading to humorous humiliation. Wrestling rings. Debutante balls. Modeling agencies. Lucy may have been funnier, but Laverne was stronger." Laverne's voice was nasal, boisterous, wheedling, teasing, sarcastic or playful: "Marshall played a whole repertoire on that brass instrument"
Laverne Marie DeFazio was a rare role model: "a tough, independent woman who didn’t need no man"
Rob Reiner on ex-wife Penny Marshall: "I loved Penny. I grew up with her. She was born with a great gift. She was born with a funnybone and the instinct of how to use it. I was very lucky to have lived with her and her funnybone. I will miss her."